The protesters say the farm is threatening their traditional way of life by impacting wild salmon and herring stocks. 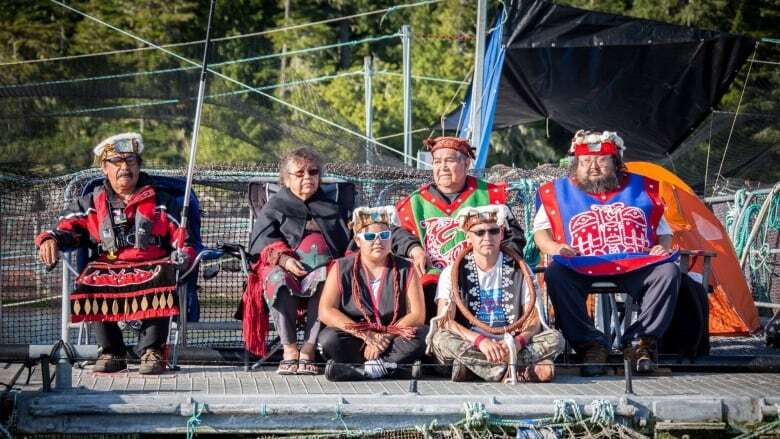 A group of First Nations and environmentalists are occupying a salmon farm near Alert Bay, B.C., and say they won't leave until the provincial and federal governments revoke permits for the facility. Ernest Alfred, a traditional leader from the 'Namgis, Tlowitsis and Mamalilikulla First Nations, said he and other protesters arrived six days ago at the farm owned by Marine Harvest Canada on Swanson Island and are now building a shelter. He said the farm is threatening their traditional way of life by impacting wild salmon and herring stocks, and he's also demanding an overall end to open-net fish farming in the sensitive Broughton Archipelago area. "We can't sit by. I cannot sit by any longer while these farms continue to infest our waters, putting all of our marine ecosystem at risk," he said. "The time for the very long debate about fish farms has passed. ... These licences of occupation need to be removed immediately." Alfred added the company does not have a formal agreement with the 'Namgis to operate in their traditional territories. Alexandra Morton, a biologist and long-time fish farm critic, is participating in the occupation with five others aboard a Sea Shepherd Conservation Society vessel. She said four Indigenous protesters have set up on the farm itself. The protest was prompted in part by video filmed by Alfred and another First Nations leader, which was then released by Sea Shepherd last week that purported to show Atlantic salmon inside fish farms in the area between Alert Bay and Campbell River. Many of the fish appeared blind, deformed or diseased, Morton said. "I was stunned. There were so many fish that were clearly in poor health," she said. Ian Roberts, a spokesman for Marine Harvest Canada, said no images indicate or prove disease. He said deformities are very rare in salmon, but like other animals and humans, they can occur. "We are able to remove any poor performing or deformed fish from our farms before they are sent to market," he said. "Our salmon are very healthy, are regularly checked for health by licensed veterinarians and audited by Fisheries and Oceans Canada." He said the company has regularly invited the 'Namgis First Nation and its members to visit and observe its operations, but to date they had declined to visit or meet. "While this unscheduled visit was a surprise to us, we have allowed them to remain on site to observe our operations as long as they remain respectful and peaceful, and not harass our staff or harm our fish," he said. "To date, they have remained relatively peaceful, but we are growing increasingly concerned about the health and welfare of the individuals. ... We have again contacted the nation's elected representative to meet and discuss their concerns." Roberts confirmed the company does not have a formal agreement with the 'Namgis, but he said the company has provided juvenile fish to the First Nation in the past for its land-based salmon farm, Kuterra. British Columbia's Agriculture Minister Lana Popham said she has not reached out to the protesters, but she plans to raise the issue with First Nations leaders at a gathering in Vancouver next week. "Our relationship and partnership with the First Nations around issues like this are critically important," she said. No new tenure permits for fish farms have been approved in B.C. since 2015. A committee is currently examining wild salmon and the aquaculture industry, and is expected to submit a report at the end of November, said Popham. Fisheries and Oceans Canada is also responsible for granting operating licences to fish farms. The department did not respond to requests for comment on Tuesday. 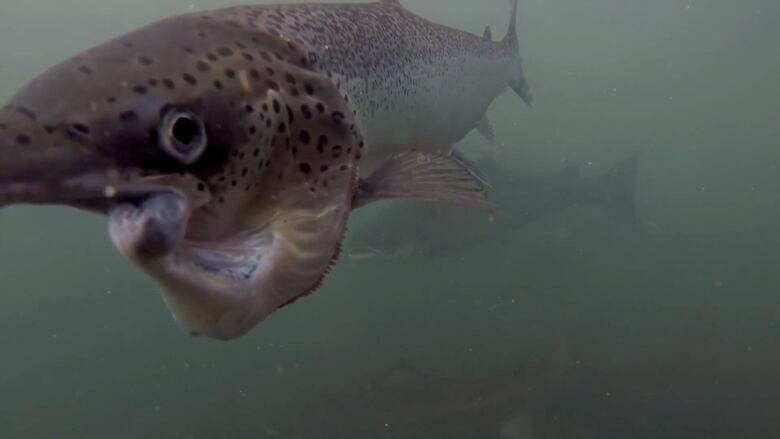 The recent escape of Atlantic salmon from a Washington state pen that held 305,000 fish has spurred debate in Canada about open-net fish farming and has led to calls for the country to focus on land-based aquaculture.